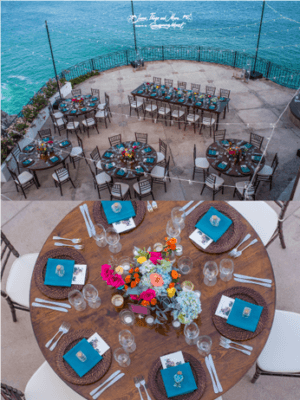 Heather and Michael – Villa Grande, Pedregal – May 2016. Hi, I want to start by thanking you again for creating such a beautiful, wonderful wedding for us. It honestly and truly exceeded all our expectations, and I was so happy with how everything turned out. I did not really have any idea of where to begin or how to go about planning a wedding, and I really appreciated all of your advice and expertise. You are welcome to use any of my comments as a testimonial, and I would also like to post positive reviews for you wherever you would like. Linens, Things and More did an amazing job designing and executing the wedding decorations. The style and the theme were just perfect and exactly what I wanted. I can’t get over how beautiful everything looked. The lights were absolutely magical, and the tables were stunning. So, so beautiful. I loved the welcome table and all of the ideas you had to add to our travel theme. I loved how everything was displayed at the table with the napkins and the menus and the favors, and the candles and the vases….everything was perfect. Once again, I would like to extend a very heartfelt thank you. It was simply magical, and I can’t thank you enough.